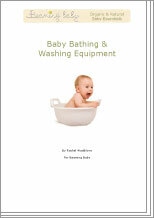 Baby Care Expert Rachel Waddilove has created this essential list of everything you need for bathing and washing your new baby. Toiletries for your baby should be gentle and suitable for sensitive skin. This essential baby bathing and washing equipment list will help you to prepare for your baby and ensure you have everything you need for the next stage.